Your decision to invest in property through The First Group comes with a host of benefits. We pride ourselves in providing investment opportunities that will yield attractive returns to our investors. We build hotels in high demand areas like Dubai Marina and TECOM, then we partner with leading hoteliers to ensure these properties enjoy high occupancy levels and great rental rates – factors that in turn spell lucrative returns for our individual hotel suite owners. The First Group has aligned with hotel industry leaders, Wyndham Hotel Group and Millennium hotels and Resorts, spelling great news for savvy investors looking to invest in the hotel industry. The First Group has an outstanding track record in building landmark hotels in Dubai; Wyndham and Millennium are both world-renowned hotel operators, making them the perfect partners to maximize rental rates and occupancy levels. For The First Group investor, these alliances add up to high demand and great returns. Our global network of premier partners are leaders in their respective industries. One such alliance is the Wyndham Hotel Group, the prestigious operator for our Dubai Marina projects. The First Group is also partnered with the Emirates Skywards and Jumeirah Group to provide our investors additional VIP benefits within their Emirates Skywards and Sirius loyalty programmes. Welcome to Al Dar Tower, a one of a kind opportunity to invest in a completed, high demand apartment development in Dubai Marina, one of Dubai’s most coveted addresses. Already operational and enjoying success, property investors can expect to earn immediate returns from both residential and holiday rental. Thanks to its excellent location, it benefits from a host of leisure and retail options right on its doorstep, is convenient to the beach and just 700m from the highly popular Dubai Marina Mall. This highly rated 40-storey tower offers investors the choice of fully fitted studios, 1, 2 and 3 bedroom apartments and 4 bedroom duplex penthouses. The perfect Dubai base or home away from home, it is easy to see why Al Dar Tower has fast become a top choice for residents and visitors alike. Arrange a free consultation with an experienced hotel investment consultant to learn more about your options. Find out more about investing in Dubai's exciting hotel industry with our downloadable Hotel Investment Guide. 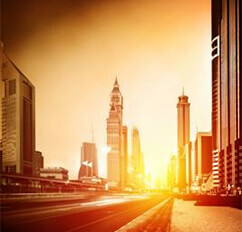 Schedule a personal consultation in our Dubai Headquarters. You have been added to our First News Brief subscriber list. Please tell us more about your interests by answering a few questions that will take you less than 30 seconds to complete.